SANTA CRUZ >> Best-selling author William Ury, who travels the globe resolving disputes, asked 250 people at the Santa Cruz Chamber of Commerce annual meeting Tuesday at the Cocoanut Grove, which is more challenging: Internal or external situations? For internal, 95 percent of hands went up. “The more internal the negotiation, the more difficult we perceive it to be,” said Ury, who became an anthropologist after spending his junior year at UC Santa Cruz and studying with professor Triloki Pandey. Called to Venezuela by then-president Hugo Chavez facing demands he resign, Ury waited three hours to be ushered in. Ury suggested a truce for the holidays, which Chavez accepted immediately. In Brazil, the 76-year-old leader of a retail business was fighting his partner for control of a company with 150,000 employees. Ury took that insight to talks with the partner in Paris, asking for agreement on the principles of freedom and dignity. Within a week, “we had both men signing an agreement wishing each other well,” Ury said. The third story was about three brothers fighting over an inheritance of 17 camels. The oldest was to get half, the middle a third and the youngest a ninth, but each wanted more. A wise woman gave them a camel, so the eldest got nine, the middle son six and the youngest two. The leftover camel, they gave back to the woman. “If we can learn to step to the balcony, reframe the situation and look for the 18th camel, that 18th camel might be us,” Ury said. Jeanne Collins, a Century 21 LAD real estate agent working for property owners, asked about the stress of serving eviction papers to tenants unable to pay rising rents. Ury answered with a story about a startup founder, forced to lay off 500 engineers, met with each one, explained he ran out of money, and asked “How can I help you?” offering a letter of referral or training opportunity. “The cheapest concession in negotiations, so often missed, is to give the other person respect,” Ury said. Afterward Collins said she would offer tenants options. William Ury, co-founder of Harvard’s Program on Negotiation and author of“Getting to Yes with Yourself and Other Worthy Opponents,”offers this advice. Go to the balcony: Observe and listen rather than reacting and allowing your inner critic to dominate. Put yourself in your own shoes: Before a sensitive phone call, ask: What do you want to accomplish? Uncover your basic needs. Commit to take care of your needs no matter what: Then you’re not so dependent on others. Change the game: Search for mutual gain. A win inside ourselves creates preconditions for us to get to yes with others. 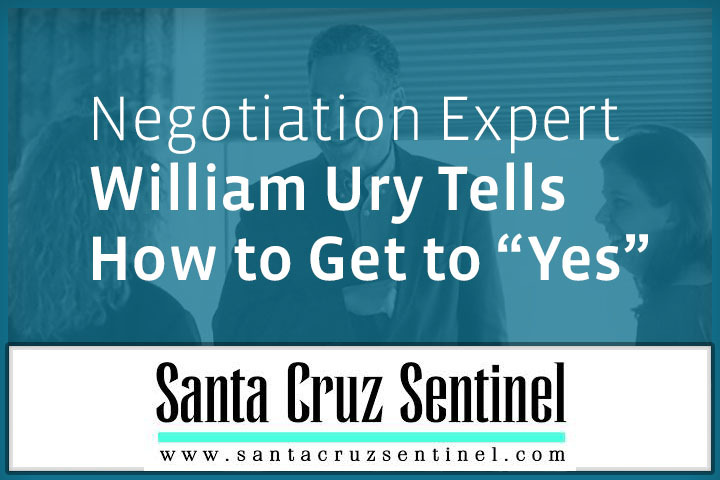 No Replies to "Negotiation Expert William Ury Tells How to Get to "Yes""